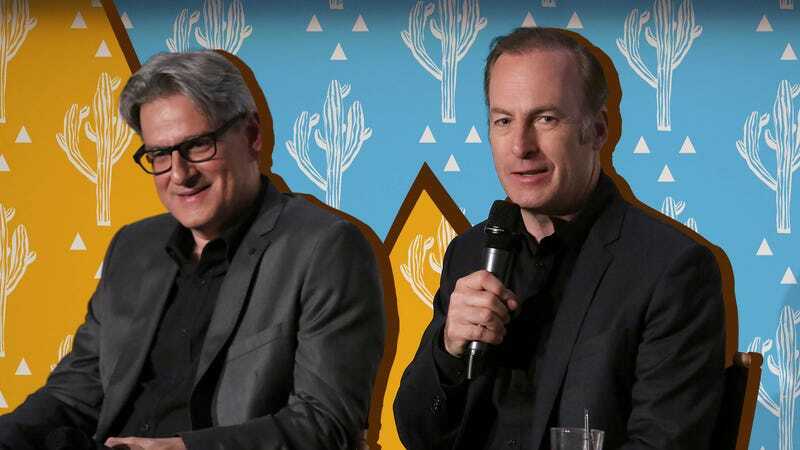 Better Call Saul showrunner Peter Gould: "We thought it was going to be kind of a romp"
Note: This interview discusses plot points of seasons three and four of Better Call Saul. It’s been three seasons now, and Bob Odenkirk’s Jimmy McGill has yet to make his ill-fated transformation into Saul Goodman in AMC’s Better Call Saul. That might change in season four—after all, the third-season finale ended with the death of Jimmy’s brother, Chuck (Michael McKean). Who knows how Jimmy might react? The new season looks to get even more tense, complicated, and dark, as it deals with the fallout from Chuck’s death, Jimmy’s suspension from practicing law, Mike’s new employers, the growing presence of Gus Fring, and more. But that doesn’t mean there won’t be time for one or two of Jimmy’s signature schemes. In anticipation of the fourth-season premiere, The A.V. Club spoke to co-showrunner Peter Gould about the loss of Michael McKean’s regular presence on set, how different the show is from what he and Vince Gilligan initially planned, and the difficulty of crafting an endgame that lines up perfectly with the start of one of the most beloved shows in recent memory. The A.V. Club: The new season picks up quite literally right after last season’s finale. Given what happened at the end of last year—the death of Chuck—did you know you wanted to dive into the immediate fallout? Peter Gould: You know, one of the great things about our writers’ room is that we try to look at everything from every angle. We always try to say, what if we did this? What if we did that? But we quickly came to the conclusion that seeing the immediate aftermath of what happened in season three was important to us, and when we tried to game out another approach, it always felt like we were missing something. Something very important. So, yeah, we did. And you know, it’s a funny thing about this show and to some extent Breaking Bad. We’ve always had these big plans for jumping forward in time. And then there’s always a good reason not to. And that’s one of the reasons I think sometimes we get a little bit of juice or dramatic momentum going, just from following events closely. But every once in a while we try to jump time. This is not one of those times. AVC: How did the show need to adjust after the death of Chuck? We obviously haven’t necessarily seen the last of Michael McKean, given how the show has always played with chronology, but the character looms so large in Jimmy’s life that his passing really shakes up the chessboard of the narrative. PG: Oh, without a doubt. And Chuck’s death was not an easy choice, partially because we loved writing the character. Chuck is ever-fascinating. And because of the man who plays him—Michael McKean is a wonderful actor. He’s also fun to work with and generous. And so having this happen was not an arbitrary decision. It’s maybe the most difficult decision I’ve ever been a part of in the writers’ room. But the way our logic worked essentially was, what happens after the big episode, the big confrontation in the middle of season three? We saw Jimmy reveal Chuck’s illness to the world. Chuck was humiliated. And the first thing we started thinking about after that was, well, how is Chuck going to strike back at Jimmy? And just as we started talking about it, I think we all felt exhausted. We thought, “Is this the only thing that this character is going to do, is to just scheme against his brother?” And Michael is such a brilliant guy. And he’s got such a reflective aspect. We thought, wouldn’t it be more interesting if Chuck learned something from this? If Chuck took a message of change from what happened in the middle of the season? AVC: What will you miss most about working with Michael, at least as a cast regular? PG: Michael. Well, for one thing, when you’re working with Michael McKean, you’re working with a man who is a real artist. He’s somebody who works very hard, who sees very deeply into the story, who does all his work, but you’re also talking about someone who is a show business legend. So you can’t work with Michael without thinking back to Spinal Tap and [Laverne & Shirley’s] Lenny and Squiggy, Best In Show, all the incredible work he’s done. And it doesn’t seem real that this guy who has done so many amazing things in show business—and by the way, what often doesn’t even get mentioned is he’s also an incredible presence on Broadway and live theater—getting to work with him on a daily basis is just really special. And he, I think, elevates every scene that he’s in. The glory of series television, for me, is that we write the show and then we learn from the show. So we watch how the scenes play out and then we learn about the characters from how the scenes play out. And we’re able to adjust the story. I think our story changed radically when we saw how Michael played this character and he taught me a lot about Chuck McGill. I think he taught all of us a lot about Chuck McGill, and by extension we learned a lot about Jimmy from the relationship that he and Bob created together. Even in that very first scene they had back in the first episode of the show. So I’m going to miss Michael on every level. But as you pointed out, we always have the hope that we’re gonna see him again because we give ourselves license to travel back and forth in chronology on this show. So who knows, maybe we’ll see him again. AVC: Now that we’re clearly approaching the tipping point for Jimmy into Saul, and other characters like Gus are beginning to play a bigger role, is it starting to get tougher to tie the narrative threads together to the eventual place we see them begin in Breaking Bad? PG: Oh, absolutely. I think we have an incredible advantage and an incredible disadvantage. Our advantage is we have all the episodes that have gone before of Better Call Saul and of Breaking Bad to draw on and to enrich the story. That’s the upside. And of course the show wouldn’t exist without Breaking Bad and without the fans who made it a success. But then the other side of it is, it’s this incredible Rubik’s Cube to keep the characters consistent—to keep the chronology consistent, to keep the locations consistent. I can’t tell you how often we’ve said, “Wouldn’t it be great if thus-and-so happened at such-and-such a place?” And then we find out that Albuquerque, like any major city, changes very quickly. And so those locations and those people may not be available to us. I can’t tell you how many times we’ve wanted characters to meet on Better Call Saul. And then we’ve looked at the scenes where they met on Breaking Bad and said to ourselves, “Could it be that they had already met in this scene? They didn’t say they were meeting for the first time.” But if you’re being honest with yourself, you say, well, it really does it look like they’re meeting for the first time. There’s all these pieces and all these parallel stories and we’re trying to make something that’s coherent and that hopefully pays off. And I have to say, it’s an ongoing process. My hope, my dream is that we’ll be able to stick the ending of the show when that ending comes. I was so proud of being a part of Breaking Bad and I really felt that Vince and the rest of us were able to stick the landing, to really have it end in a satisfying way, to finish the story as it began and to really be telling one coherent story. And I’m hoping we can do the same thing on this show. But it’s a struggle, and it’s a little daunting. AVC: Does it still surprise you to see how much darker and complicated the series continues to get as it goes along, considering how lighthearted and comedic you had initially planned it to be? PG: Oh my god. [Laughs.] When Vince and I started this, I think we thought it was going to be kind of a romp, to be honest with you. I think when we had our initial pitch to AMC and Sony, once we had discarded the idea of doing it as a half-hour even then, even when it was the first hour version, it was just much more lighthearted legal fun and shenanigans. I will hasten to say that there are, still, shenanigans in this season. In fact, I think some of our best shenanigans ever this season. But the shenanigans and the scams and the twists are all in the context of much deeper characters than I could’ve ever imagined. So yeah, the show has completely taken me by surprise. But I think we arrived at it in as organic a process as we could, and it’s really by constantly asking ourselves, you know, what would these people be thinking about right now? What does Jimmy want at this moment? What does Chuck want at this moment, what does Kim want at this moment? And by trying to be as honest as we could with ourselves about who these people were and are and are becoming. So it’s completely surprising to me, but it’s just the result of dogged pursuit, of trying to understand these people. AVC: Just quick before we wrap, I have to ask: Am I crazy, or are there more blue accents in this season than before? PG: [Laughs.] We absolutely pay an awful lot of attention to color. Color is fascinating to all of us as a way of telling the story and commenting on the story. Not everything has a symbolic value—but I think it’s interesting that there’s more blue. I like that observation.